A new book, Against the Death Penalty: International Initiatives and Implications, features leading scholars on the death penalty and their analysis of both the promotion and demise of the punishment around the world. It considers the current efforts to restrict the death penalty within the United Nations, the Council of Europe, the African Commission, and the Commonwealth Caribbean. It also investigates perspectives and questions for retentionist countries with a focus on the United States, China, Korea, and Taiwan. Among the authors in this compendium are Roger Hood, William Schabas, Peter Hodgkinson, and DPIC's Executive Director, Richard Dieter. Mark Osler, a former federal prosecutor and present faculty member at a conservative Christian law school in Texas, has writtenJesus on Death Row: The Trial of Jesus and American Capital Punishment. The book offers a comparison between the trial and execution of Jesus and a capital case conducted in the U.S. justice system. The use of paid informants, conflicting testimony of witnesses, and the denial of clemency in both Jesus’ case and in recent cases in the U.S. are cited as examples of existing parallels. 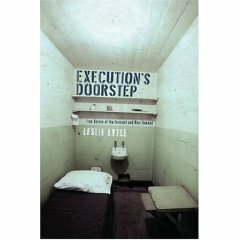 In her new book, Execution’s Doorstep: The True Stories of the Innocent and Near Damned, author Leslie Lytle provides a compelling narrative recounting the harrowing journeys of five innocent men who spent many years on death row. Through extensive research and interviews, Lytle has succeeded in revealing the deep pain and suffering that such injustice yields, putting a human face to the recurring problem of innocence on death row. The book explores all aspects of the cases, from the crime and the trials to the time spent on death row and the difficult struggle to adjust to life outside of a maximum security prison. Through the stories of these five men, Lytle provides readers with a penetrating look at America’s criminal justice and capital punishment systems, showing their fallibility. Leslie Lytle is the Executive Director of the Cumberland Center for Justice and Peace. (Northeastern Univ. Press 2008). To date, 130 men and women have been exonerated from death row since 1973. See Innocence and Books. Murder and the Death Penalty in Massachusetts (University of Massachusetts Press, 2008) can be purchased here. See also Books. In 1982, as a second term Assemblyman, Raymond Lesniak voted to reinstate the death penalty in New Jersey. In December 2007, New Jersey voted to abolish the death penalty, becoming the first state in 40 years to accomplish this. Senator Lesniak was one of the sponsors and legislative leaders of the abolition bill. He has written a new book: "The Road to Abolition: How New Jersey Abolished the Death Penatly." For more information about the book, see The Road to Justice and Peace. Posted May 10, 2008. Consistently Opposing Killing is the most complete compilation to date of writings by leading scholars and activists for peace and justice who embrace the consistent life ethic. Recognizing that just as the various manifestations of violence are inter-connected, so must be the means to address them, more than a dozen contributors explore how violence consistently fails as a solution to society’s problems, and how violence and injustice can only be effectively challenged through nonviolent means. Novels by the prolific Jodi Picoult often have a provocative "ripped from the headlines" intensity, from the euthanasia issue of "Mercy" to the mass school killings in last year's "Nineteen Minutes." But with her latest novel, "Change of Heart," Picoult creates her own sensational controversy that sits uneasily on the fault line of religion in America, which she believes has become one of the country's most divisive. "Change of Heart" unflinchingly explores the complexities and emotions of the death penalty. The story takes place primarily on death row, where a poor, uneducated young handyman awaits execution for the murder of a policeman and his daughter. As he contemplates his past and his fate, Shay Bourne, who has been marginalized for most of his life, comes to believe that the only way he can redeem his troubled existence is to donate his heart after his execution. However, there are two major stumbling blocks. The first is that the state of New Hampshire's legal form of execution is lethal injection, which renders the heart unusable for transplant. The second is that Shay has picked a special recipient for his heart - the sister of the girl he is accused of killing - and the desperately ill 11-year-old Claire wants nothing to do with it. Into this complicated setup arrive Maggie, Shay's lawyer, and Michael, one of the jurors who reluctantly voted to convict Shay 11 years earlier. Now a somewhat conflicted priest, Father Michael finds himself in the role of the condemned man's spiritual adviser. "Ever since I had taken my vows and asked God to help me offset what I had done to one man with what I might yet be able to do for others - I knew this would happen one day. I knew I'd wind up face-to-face with Shay Bourne." However, Shay doesn't recognize Michael, who keeps silent not to protect himself from Shay's anger but to facilitate the man's redemption. Like "Nineteen Minutes," "Change of Heart" unfolds through the first-person narratives of those involved, offering a variety of perspectives. In addition to Shay's allies, there are Lucius, the artist with AIDS convicted of killing his lover in a fit of passion, and June Nealon, the still-grieving widow and mother of Claire. This gives the narrative richness and texture, but it can also feel a little formulaic after a while. The one person whose inner world we never plumb is Shay himself; except for moments of recounted dialogue, his story is told through other voices. While "Change of Heart" is a compelling page-turner, it is more than just a suspenseful countdown to an execution. The disturbing, thought-provoking questions Picoult poses about capital punishment, the ethics of organ donation, and the moral dilemma of telling the truth at all costs go well beyond the issue of whether Shay will be allowed to die in a way that preserves his heart and whether Claire will accept it as her own. Picoult also plants seeds of mysticism and miracles, as Shay begins to quote obscure gospels and those in his cell block experience unexplained instances of healing. This begins to attract fervent attention from people on the outside, who wonder if Shay is the Messiah. Is he a sinner or a saint? While intriguing, the overlay is a bit distracting, and this plot element, as well as an improbably facile romance between the self-denigrating Maggie and Claire's doctor, lends "Change of Heart" the kind of leavening that says "commercial appeal." But thankfully, its literary heart beats strong; Picoult is a skilled wordsmith, and she beautifully creates situations that not only provoke the mind but touch the flawed souls in all of us.